Already booked on one of our packages to Morocco? See everything you need to know before you go. Immunizations are NOT currently required for travel to Morocco. However, you may wish to consult your personal physician or local public health authorities as to their suggestions on other health concerns or requirements. Morocco generally has a sub-tropical and diverse climate depending on the region and season. October-December and March-May are Morocco’s best seasons, when temperatures average in the low 70s F/24 C. January and February can be cool and rainy. Because of the generally moderate or warm climate, most of the hotels do not have central heating. During summer, the average temperature in Marrakesh and Fez is around the 100’s; while the coastal cities of Casablanca, Rabat and Tangier have an average temperature in the low 80s. South of the Atlas Mountains, temperatures increase greatly. Take along at least a sweater year-round for evenings in higher elevations and the desert, and warm and waterproof clothes for December–March. Since weather can be unpredictable anywhere in the world, it’s important to pack clothing that can be worn in layers, so that you are prepared for all weather conditions. We suggest packing a folding umbrella or poncho, and a sweater and/or jacket as well. We also recommend that you bring sun block, sunglasses and at least a pack of tissues or wipes. Remember that comfort and convenience should dictate your wardrobe, and casual clothes are in order for most every occasion as you travel. Appropriate attire when traveling in Muslim countries: Since Morocco is primarily a Muslim country, customs will be different from what you are accustomed to in the USA. When visiting mosques and for touring, you should plan to dress modestly with shoulders and knees concealed. Despite the heat, it is still preferred that women do not wear shorts or halter-style tops. Jeans and slacks or long skirts are recommended. Loose fitting shirts or tunic are also considered appropriate. Wearing a headscarf can help women blend in. Please Note: If visiting mosques and other sacred sites, kindly ensure to dress appropriately – long sleeves, long, loose fitting, ankle length trousers or skirts for women and men. No light colored and transparent or see through clothing for women. The official currency in Morocco is the Moroccan dirham. Hotels and some stores accept credit cards (Visa and Master Card only), however, credit card transactions are subject to 3% surcharge. For “street shopping” you will need local currency for most transactions (USD is only sometimes accepted). Hotels, banks and foreign exchange bureaus will be able to exchange cash to local currency. We highly recommend that you bring along crisp, new bills, because old, torn, or crumpled bills may not be accepted. For small purchases, we recommend that you use the ATM machines to get cash in local currency so that you can avoid using your credit card in unknown shops where there is a higher risk of having your credit card numbers “borrowed” for unauthorized purchases. Traveler’s checks are no longer widely accepted. We recommend that you use cash or credit card. Morocco is best known for wool carpets and leather goods but most of what is sold is of poor quality. (A quick test for real wool is to take a small tuft from the carpet and burn it with a match or lighter. If it smells like burning plastic, it’s acrylic fiber.) Other items available include gems, fossils from the Sahara, thuya wood carvings, pottery, mosaic tiles, beaten brass, silk, hand-embroidered clothing, copperware, silver and gold. You will have ample opportunity during your visit to Morocco to shop for souvenirs, including artwork, handicrafts and even jewelry. If you purchase such items, do so with the understanding that these items may not have the same high value you were led to believe. And you may be unable to return these items later for a refund. A good rule of thumb when shopping abroad is to choose items that you love and that will remind you of the destination. If you want to shop for high value items, better do so from a trusted merchant at home unless the pleasure of the happy memory of your trip will keep you from regretting your purchase. While we take great care in arranging the components of your tour, we have no relationship with the shopping venues you’ll encounter, and we cannot be liable for any purchases you make. Your guides will no doubt have some favorite shopping places, where the vendors are known, provide good quality merchandise and probably pay some sort of commission from sales to the guide. This should not surprise or offend you. This is how business is done throughout Morocco and other regions around the world. Please keep in mind that many, if not most stores outside the U.S. will not allow exchanges or refunds for your purchased items. You, as the buyer, assume the full risk in the purchases you make. Tips for Bargaining: Bargaining is a way of life in Morocco. If you want to purchase something, whether in a shop or a souk (or bazaar) and you think the price you’ve been quoted is too high, thank the vendor and walk away. Generally, he/she will come after you with a lower price. It is generally considered good bargaining policy to offer half the asking price, and negotiate from there. But the negotiations should be done in a respectful way. 220 volts. Plugs C & E. You will need a voltage converter and plug adapter in order to use U.S. appliances. We recommend getting a universal adapter and converter kit. View more information about electrical standards around the world. Cameras and video recorders are permitted, and photography is generally permitted everywhere except at airports and military installations. Memory cards for digital cameras will be available in major cities. 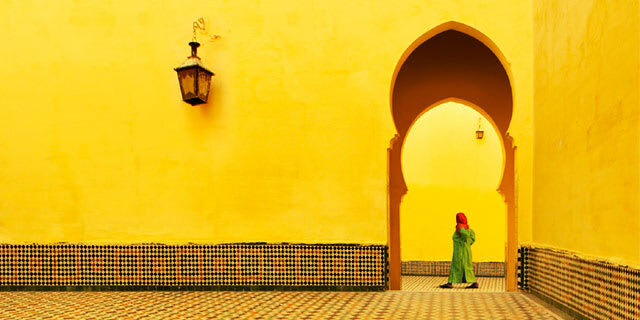 Check out our blog for our latest articles on Morocco.